Like always life continues and on really good weeks funny things happen that cause us to laugh and so here’s one that’s really FUNNY! The parentals occasionally receive a product from companies who want them to try things out and blog about it or give feed back. Since Mom is the queen of blogging, tweeting and instragramming we get a few items here and there. Of course Dad grumbled something along the lines with “you try out the leash” and I knew I had him, ready, set, match. He looked at the box and opened up this bright green package. I could see from his expression he was not pleased one bit. It had a big strap with zippers, pouches and a clasp. I saw him really search in the small box for instruction and there were none. In his confusion he tried to put the fanny pack belt on me. The absolute best part was when you realized he was supposed to wear the fanny pack belts and I was to be hooked up with the leash part. It was hilarious, as I know how much Dad has an aversion to fanny packs. Next we stepped outside attached literally at the hip. Boy it was AWESOME People he had no control over me and I took off, next thing I looked back and he was using his outside voice. I then saw a nice family walking by our yards and I just stood perfect. (You see when people are around I am flawless for the compliments). Dad on the other hand was embarrassed, tangled up and definitely not having a good exercise moment. I knew the walk was over before we hit the end of the driveway so I ran back to the house. My swiftness whipped Dad around and this made the veins stick out in his neck. “ This would have been perfect during months 7-12 when he had to be tethered to us in the house all the time”. (You see I was always getting into stuff so they kept me on the inside leash). “The leash would be PERFECT (he gave me a glance of frustration) if the dog walked nice and doesn’t PULL”. Who cares what he thinks, it was really cool pulling Dad up and down the driveway. Perry 1 – Dad big fat zero! Works great if you have a dog that enjoys to leisurely walk or if you run. Also, nice compartments for a water bottle and a well sized pouch for keys, phone or money. Finally, it is made with quality materials and is apparently self instructional unless my Dad is trying it on. 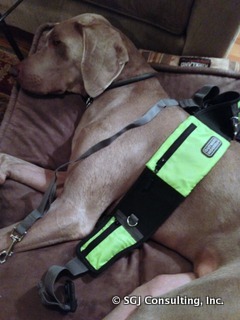 And perfect for puppies who need to be tethered all the time while inside like I was when I was of course MUCH younger. OK, people as you can see I am tired and there was no way I was trying that thing on again. Oh – almost forgot. It was a beautiful fall day in Santa Monica. Since your cousin Maggie does not know how to walk for the first mile or so, I don’t think this product would work for her. No doubt I too would experience whiplash.